The engines for the China-bound 500, as well as those used in the U.S. and Latin America, will come from a Chrysler plant near Detroit. 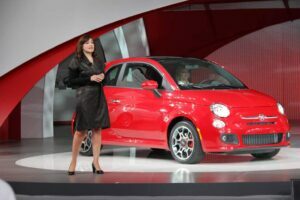 While Fiat/Chrysler hasn’t made a formal announcement, chief executive Sergio Marchionne has already confirmed the plans for exporting vehicles from Mexico, noted Laura Soave, the executive responsible for bringing the Fiat brand back to the U.S. Soave added Fiat/Chrysler already has sales executives on the ground in China to handle the launch of the 500. The 500 is already sold in 80 countries around the world and Fiat’s plans call for expanding the sales to additional markets around the world. Meanwhile, the first boatload of the recently-redesigned Jeep Grand Cherokee exported from Detroit has reached China. The exports to China of the new Grand Cherokee, which has earned a host of honors from the North American automotive press, is one part of the strategy to expand Jeep sales at home and abroad as Jeep celebrates its 70th anniversary this years, according to Chrysler officials. “Jeep is one of the best-known brands in the world. It’s as recognizable as Coca Cola,” said Jeep brand boss Mike Manley, who noted that in many parts of the world, driving a Jeep is a status symbol, noting Chrysler has quietly sold more than 12,000 Jeep Compass in China in the past couple of years and Chinese distributors and dealers want to get more, Manley said. Building up Chrysler’s exports is one of a series of challenges the Obama Administration set for Fiat, as part of the U.S. market’s federally-funded 2009 bailout. If Marchionne can meet all three – and also pay off Chrysler’s federal loans – Fiat could gain a 51% stake in the U.S. company, up from 20% following Chrysler’s emergence from Chapter 11.